There is without a doubt still a strong element of tribalism in a lot of African countries. I am not referring to the negative meaning of the word, as it is often used in western media to trivialise political disputes in African countries. I am talking about the strong sense of cultural identity, of being linked by a common or shared tradition. This is what links Debonheur to Franco. 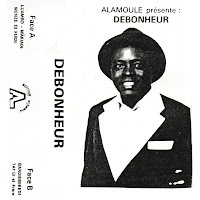 And that's more than likely the reason why Debonheur is singing in their native Kikongo language about his fellow Bakongo (or should I write "Kongo"?) on this wonderfully raw cassette. EDIT June 10, 2013: I have renewed the downloadlink. EDIT February 11, 2014: I have - once again - renewed the download link. EDIT April 12, 2015: again the link has been refreshed. this post's extra link is dead. thank you very much for this cassette! very nice music! @Anonymous: There was no link to mediafire (not my favourite service..), but the link was dead and has been now restored.